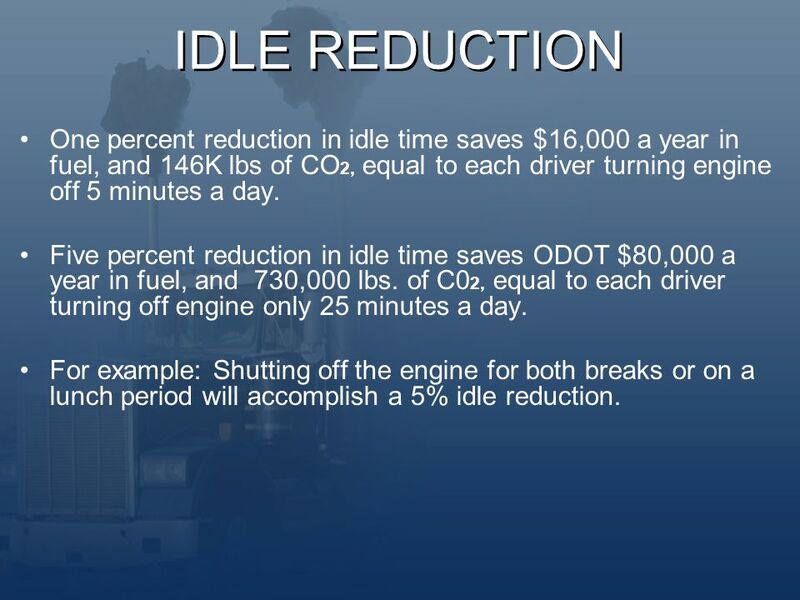 ODOT FUEL USAGE BENEFITS OF IDLE REDUCTION. 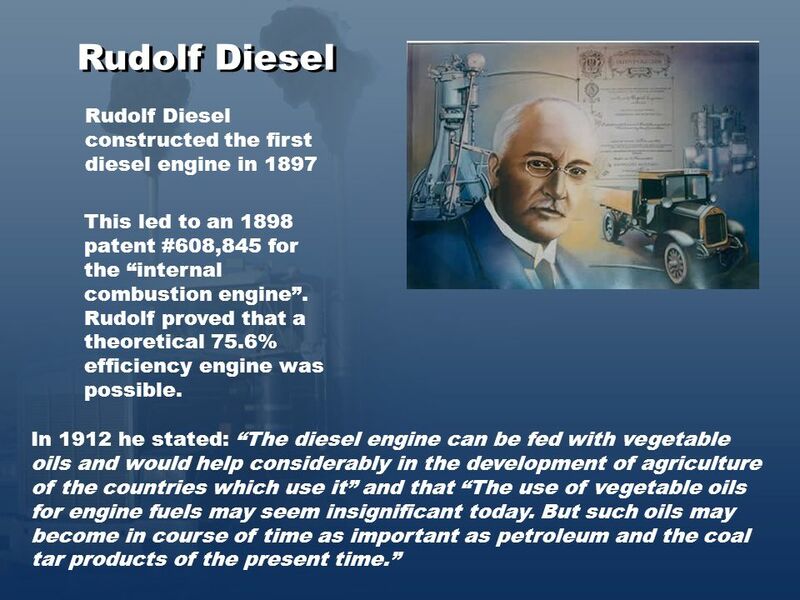 Rudolf Diesel Rudolf Diesel constructed the first diesel engine in 1897 This led to an 1898 patent #608,845. 2 Rudolf Diesel Rudolf Diesel constructed the first diesel engine in 1897 This led to an 1898 patent #608,845 for the internal combustion engine. Rudolf proved that a theoretical 75.6% efficiency engine was possible. In 1912 he stated: The diesel engine can be fed with vegetable oils and would help considerably in the development of agriculture of the countries which use it and that The use of vegetable oils for engine fuels may seem insignificant today. But such oils may become in course of time as important as petroleum and the coal tar products of the present time. 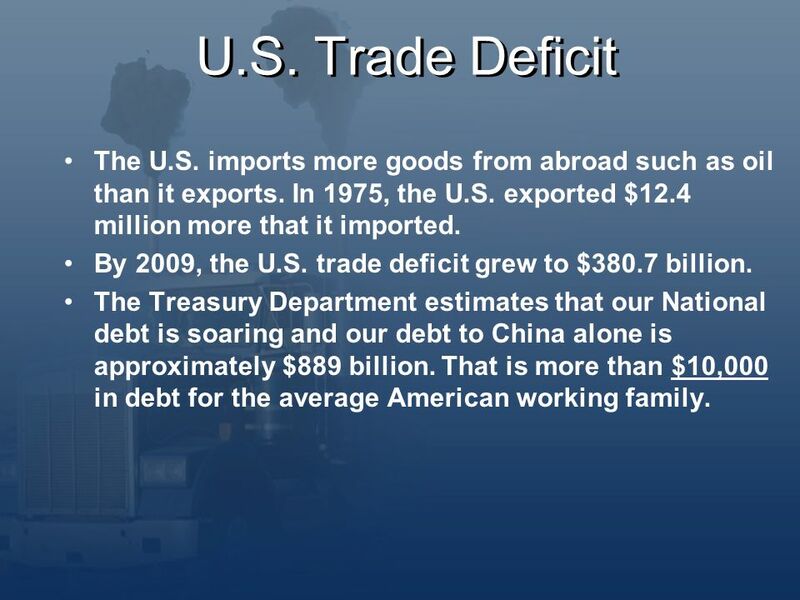 3 U.S. Trade Deficit The U.S. imports more goods from abroad such as oil than it exports. In 1975, the U.S. exported $12.4 million more that it imported. By 2009, the U.S. trade deficit grew to $380.7 billion. The Treasury Department estimates that our National debt is soaring and our debt to China alone is approximately $889 billion. That is more than $10,000 in debt for the average American working family. 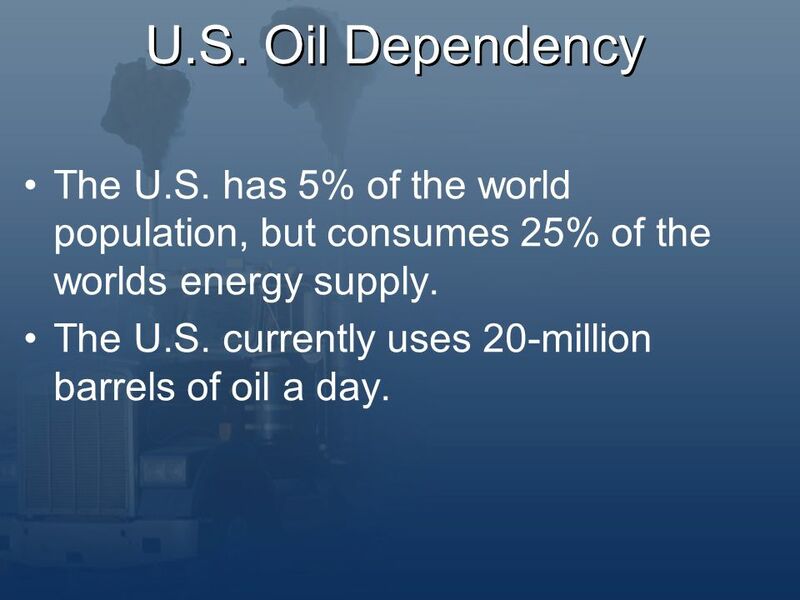 4 U.S. Oil Dependency The U.S. has 5% of the world population, but consumes 25% of the worlds energy supply. 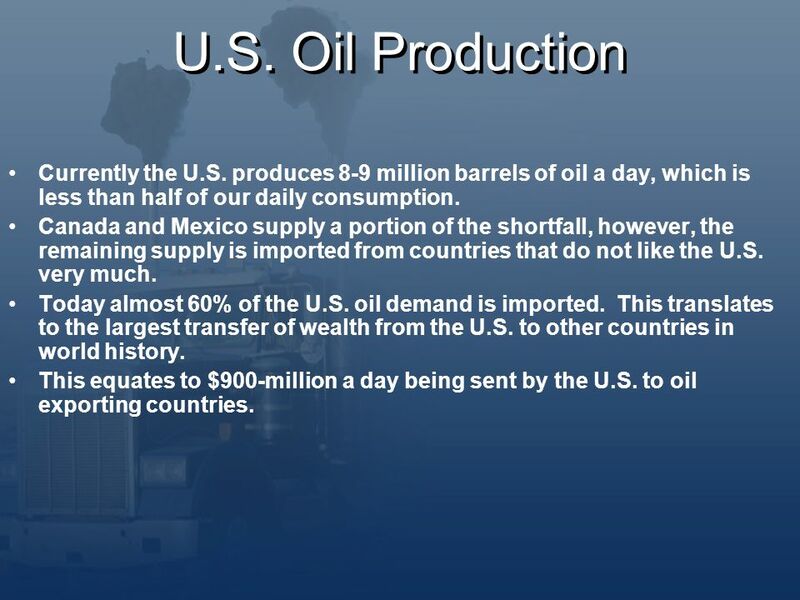 The U.S. currently uses 20-million barrels of oil a day. 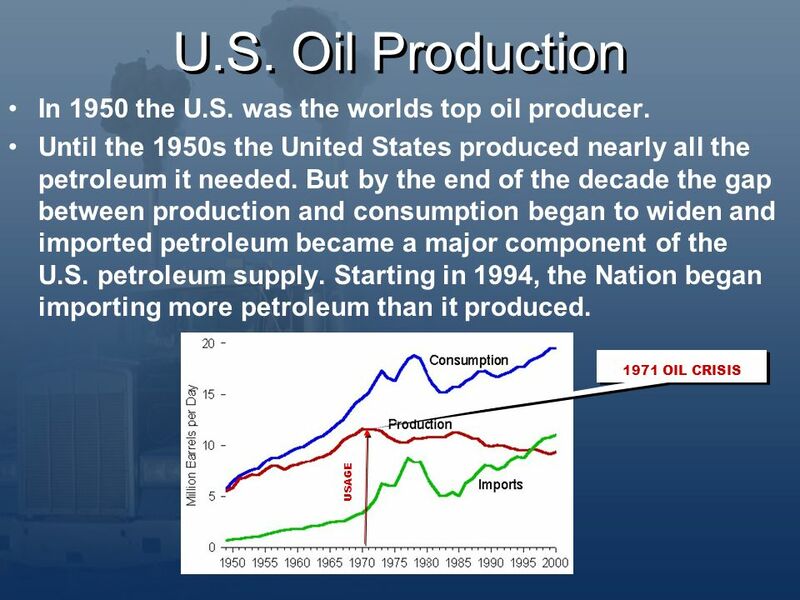 6 U.S. Oil Production Currently the U.S. produces 8-9 million barrels of oil a day, which is less than half of our daily consumption. Canada and Mexico supply a portion of the shortfall, however, the remaining supply is imported from countries that do not like the U.S. very much. Today almost 60% of the U.S. oil demand is imported. This translates to the largest transfer of wealth from the U.S. to other countries in world history. This equates to $900-million a day being sent by the U.S. to oil exporting countries. 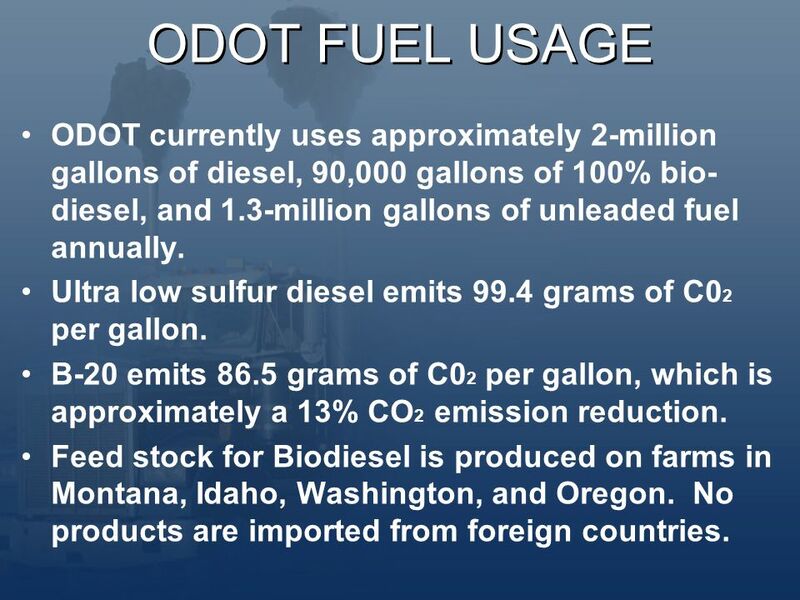 7 ODOT FUEL USAGE ODOT currently uses approximately 2-million gallons of diesel, 90,000 gallons of 100% bio- diesel, and 1.3-million gallons of unleaded fuel annually. Ultra low sulfur diesel emits 99.4 grams of C0 2 per gallon. B-20 emits 86.5 grams of C0 2 per gallon, which is approximately a 13% CO 2 emission reduction. Feed stock for Biodiesel is produced on farms in Montana, Idaho, Washington, and Oregon. No products are imported from foreign countries. 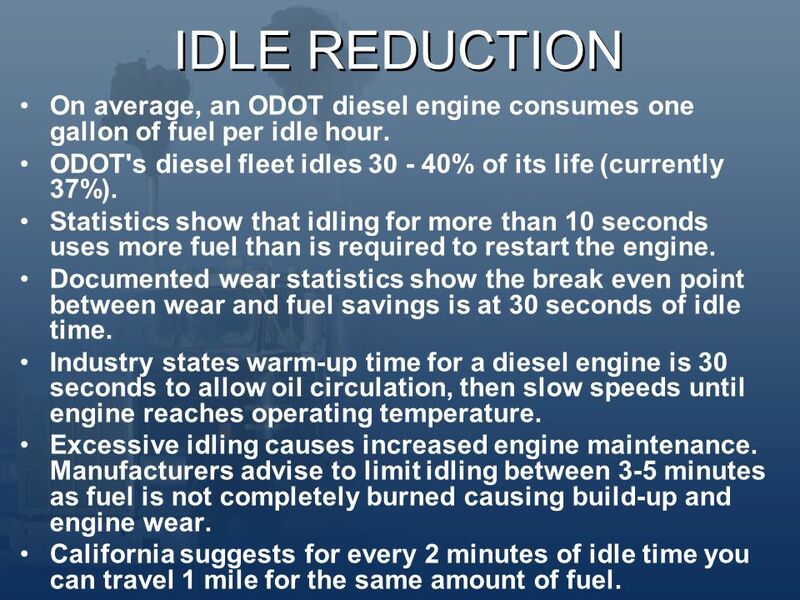 8 IDLE REDUCTION On average, an ODOT diesel engine consumes one gallon of fuel per idle hour. ODOT's diesel fleet idles 30 - 40% of its life (currently 37%). Statistics show that idling for more than 10 seconds uses more fuel than is required to restart the engine. Documented wear statistics show the break even point between wear and fuel savings is at 30 seconds of idle time. 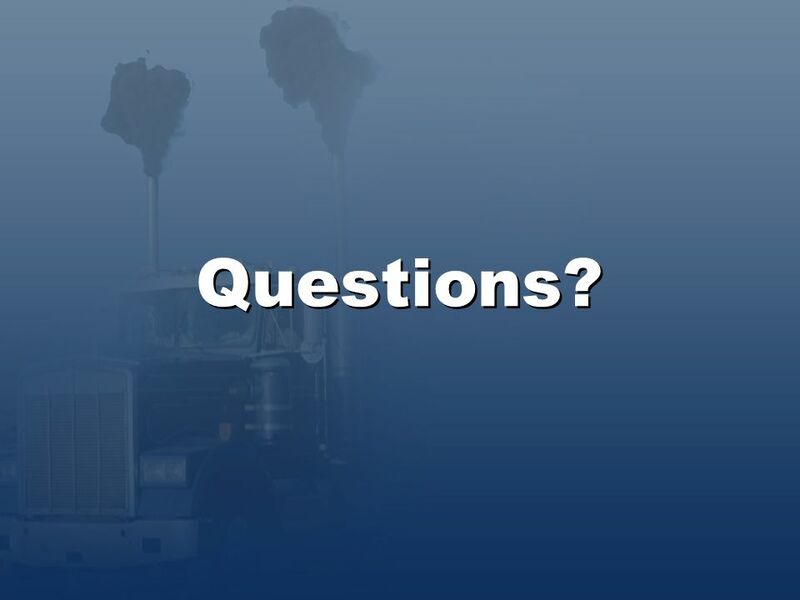 Industry states warm-up time for a diesel engine is 30 seconds to allow oil circulation, then slow speeds until engine reaches operating temperature. Excessive idling causes increased engine maintenance. Manufacturers advise to limit idling between 3-5 minutes as fuel is not completely burned causing build-up and engine wear. California suggests for every 2 minutes of idle time you can travel 1 mile for the same amount of fuel. 9 IDLE REDUCTION ODOT Fleet is installing engine coolant cab heaters in all new 10 yd, 5 yd and 1 ton trucks. These heaters work from drawing heat from the engines coolant system after the engine has been shut off. This devise allows operators to shut the engines off between shifts and during lunch and breaks while the devises still provide heat and prevents freeze up. ODOT Fleet is replacing incandescent and halogen lamps in all new and some older 10, 5, and 1-ton trucks. This allows the battery to power lights for an extended period without the engine running. We are replacing VMS signs with new LED full matrix VMSs, which extends the battery operating time without the engine running. 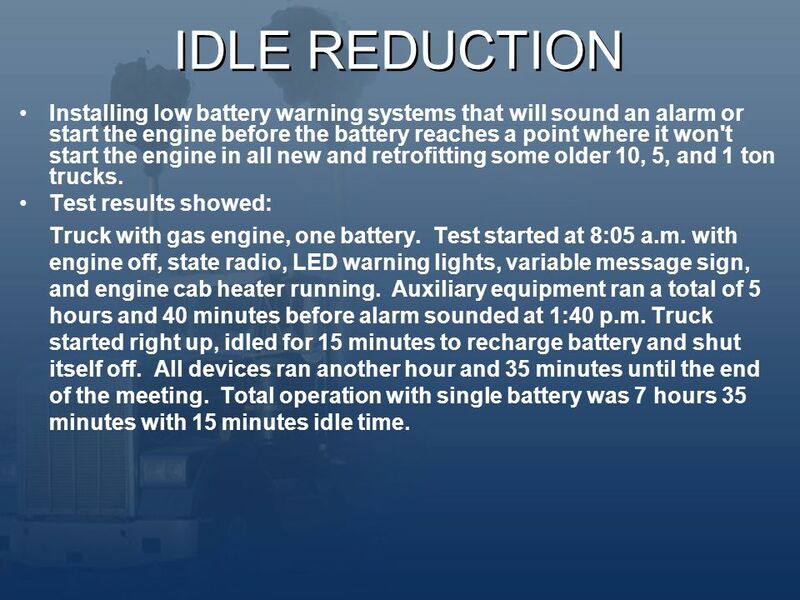 10 IDLE REDUCTION Installing low battery warning systems that will sound an alarm or start the engine before the battery reaches a point where it won't start the engine in all new and retrofitting some older 10, 5, and 1 ton trucks. Test results showed: Truck with gas engine, one battery. Test started at 8:05 a.m. with engine off, state radio, LED warning lights, variable message sign, and engine cab heater running. Auxiliary equipment ran a total of 5 hours and 40 minutes before alarm sounded at 1:40 p.m. Truck started right up, idled for 15 minutes to recharge battery and shut itself off. All devices ran another hour and 35 minutes until the end of the meeting. Total operation with single battery was 7 hours 35 minutes with 15 minutes idle time. 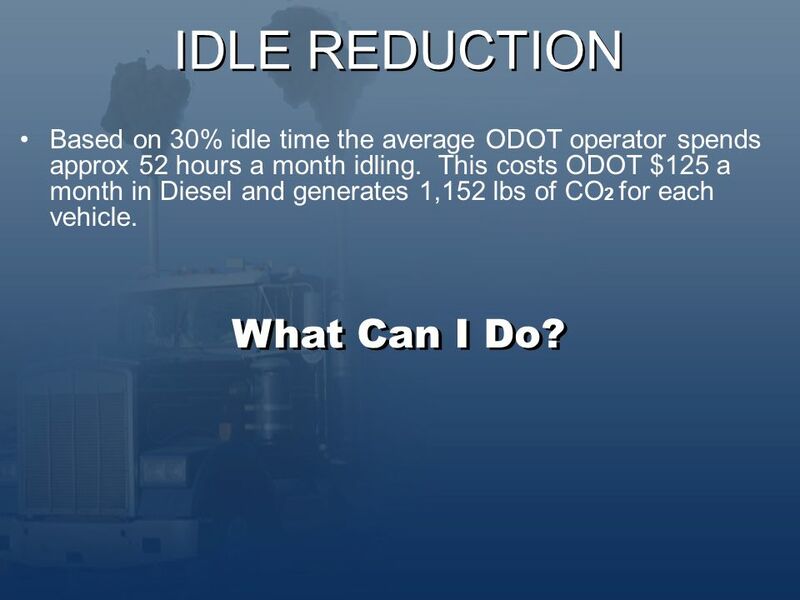 11 IDLE REDUCTION Based on 30% idle time the average ODOT operator spends approx 52 hours a month idling. This costs ODOT $125 a month in Diesel and generates 1,152 lbs of CO 2 for each vehicle. What Can I Do? 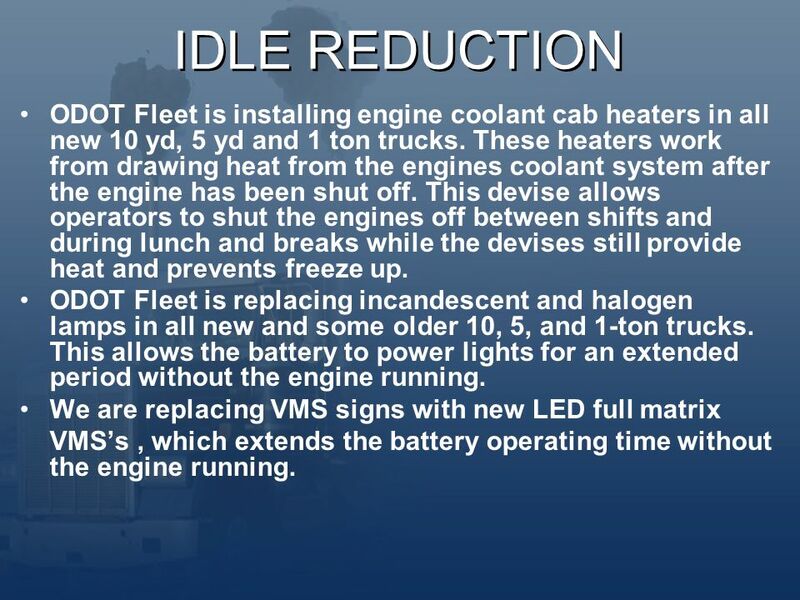 12 IDLE REDUCTION One percent reduction in idle time saves $16,000 a year in fuel, and 146K lbs of CO 2, equal to each driver turning engine off 5 minutes a day. Five percent reduction in idle time saves ODOT $80,000 a year in fuel, and 730,000 lbs. of C0 2, equal to each driver turning off engine only 25 minutes a day. For example: Shutting off the engine for both breaks or on a lunch period will accomplish a 5% idle reduction. 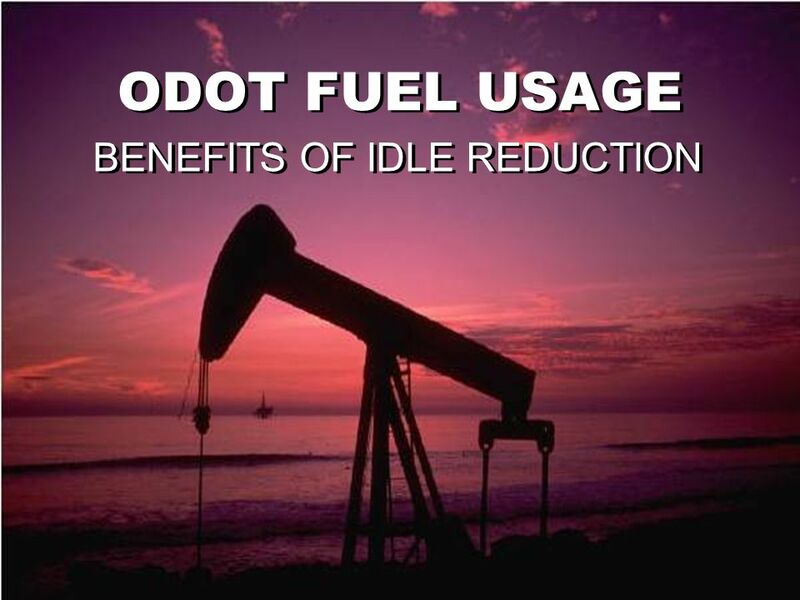 Download ppt "ODOT FUEL USAGE BENEFITS OF IDLE REDUCTION. Rudolf Diesel Rudolf Diesel constructed the first diesel engine in 1897 This led to an 1898 patent #608,845." ODOT purchased five Nissan Leaf Sedans in 2011 Key Purchase Factors Fuel Savings Owning and operation of more environmentally friendly vehicles. ODOT Fleet. 1 Natural Gas Opportunities with Heavy Duty Vehicles Andrew J. Littlefair, CEO. Renewables (CHP), Global Warming, and Energy Efficiency Richard Brent Solar Government Affairs Lake Tahoe, California July 28, 2005 California Manufacturers. Air Quality Division Oklahoma Department of Environmental Quality. 1. 2 Objectives Explain how to implement green fleets Learn about incentives for utilizing idle reduction technologies and strategies Learn about the. Hopedale, MA Cranbury, NJDalton, GA Jessup, MDSyracuse, NY Emissions Reduction Strategies April 14, 2010. The One Tonne Challenge Government of Canada. One Tonne Challenge - Overview A challenge to Canadians to reduce their GHG emissions by one tonne or by. WMATA ALTERNATIVE FUEL/CLEAN FLEET PROGRAMS PRESENTED TO VIRGINIA TRANSIT AGENCIES JUNE 9, 2009. The [City/Town X] Clean School Bus Team Kick-Off Meeting. The Science and Economics of Energy: Learning about Solar Energy.